Appealing most to those working with acoustic guitars, but also built for classical stringed instruments, this plugin is the latest in Audified's ToneSpot series. This channel strip plugin offers Saturation, Shaping, Punch , Surgery, Smash and Effects modules, and includes a few 'subjective' controls such as Wood, Sparkle and Paper. 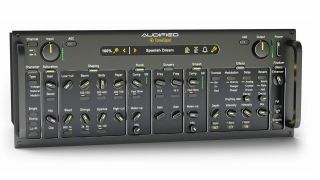 The controls seem to offer comprehensive, results-oriented control over the sound of the instruments you're working with, solving common problems with mixing and controlling acoustic instruments. Audified says that, "Stringed acoustic instruments frequently find themselves fighting against busy arrangements, where several layers of instruments can clash with one another. Also, recordings can sometimes sound too thin, harsh, or sterile. So a tone that can clearly cut through the mix is what’s needed." This plugin is the latest in the ToneSpot series, following Audified's release of the bass-oriented channel strip in February. ToneSpot Acoustic Pro is available now from the Audified website at a price of $49, later rising to $99. A demo version is available.